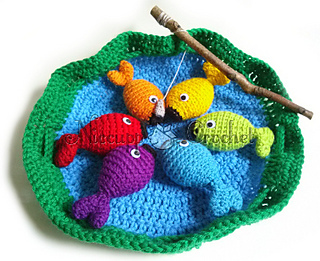 This is a super fun and delightful fishing game that can be used in a preschool setting or just as a fun game for kids! I tested this game out with my 4 year old and he had a lot of fun. I turned different colored cards face down on the floor and had him pick one, then he had to fish for that color of fish. He had fun doing both activities. At his age, he knows better than to put non-food items in his mouth. But, as with any toy with magnets, always use caution! 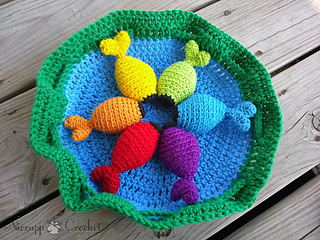 My Sunday school kids had a lot of fun with this game, too, even the 5th and 6th graders wanted to have a turn at catching fish. I am sharing the pattern free. 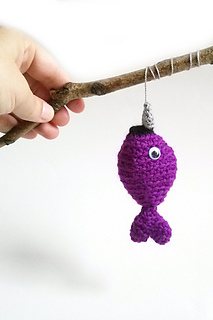 You may sell completed items made from this pattern. 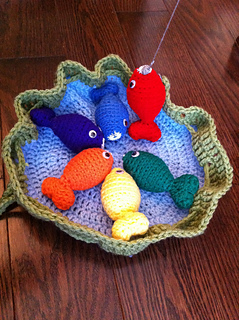 When selling crocheted items, you should always make and photograph your own items. You may not use my photos for selling purposes. Please do not copy/paste the pattern. 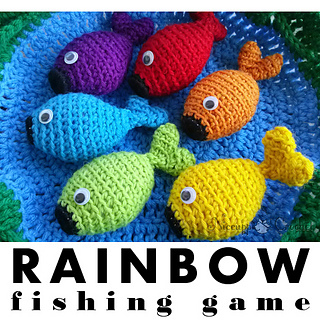 Please share the blog link with others who may be interested in making the fishing game.